Morganite is a beautiful gem that’s a pastel-pink cousin to the popular beryls, which include emerald and aquamarine. It was discovered in the early 20th century in both California and Madagascar. Although, it’s really pink beryl, it was renamed to morganite in honor of J.P. Morgan who was a famous financier. While it’s not as expensive as a diamond, it’s almost as rare. There aren’t many stones available for jewelry. Morganite comes in colors ranging from peach-pink to pink, salmon and purplish pink. 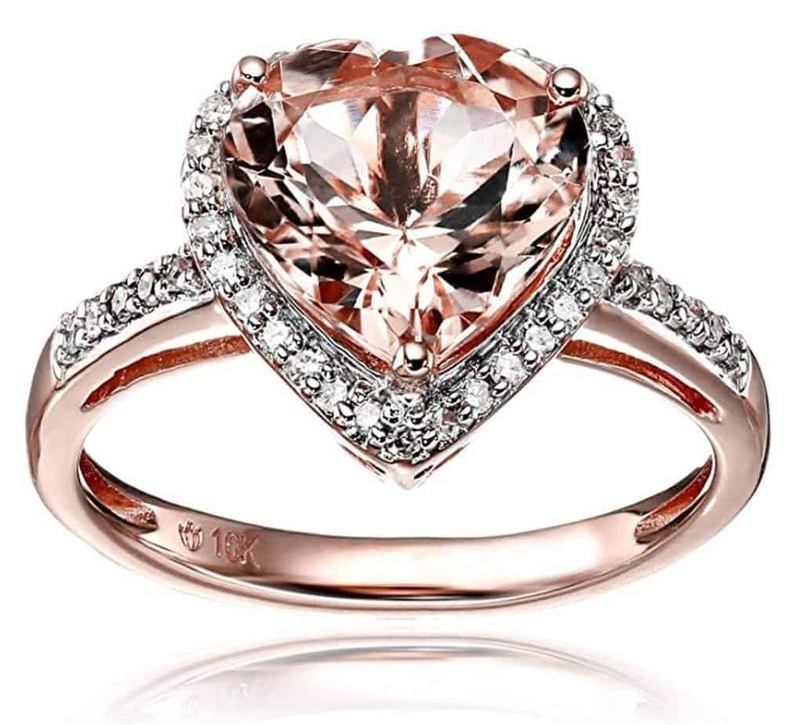 Pink engagement rings are particularly trendy right now, and if you want to get her a pink engagement ring, but can’t afford a pink diamond, this is a fantastic alternative. If you’re buying a morganite ring for yourself, good for you! 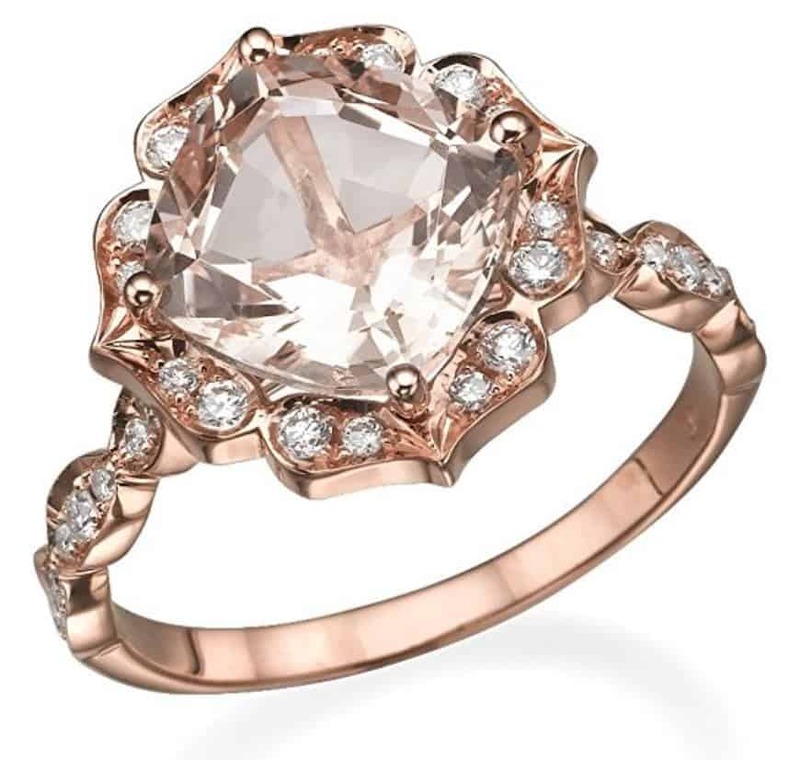 There are truly some pretty choices for rings especially when they’re set in a rose-gold setting. It really complements the color. This is such a pretty ring that it’s part of the Amazon Collection of jewelry. All diamond suppliers with the Amazon Collection confirm that they are compliant with the Kimberly process, which means conflict-free diamonds. 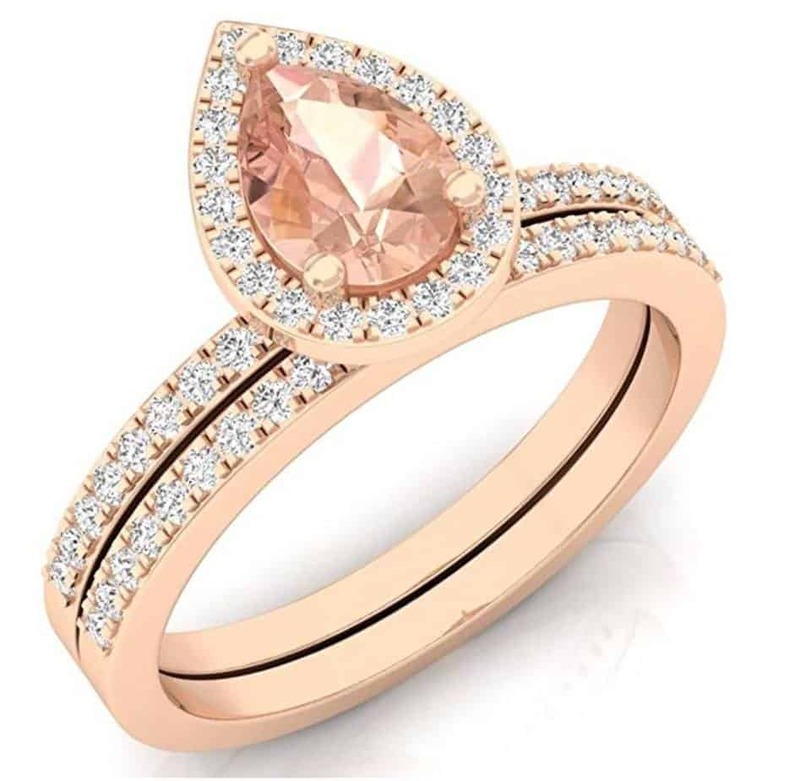 The morganite on this ring is a 10 mm heart-shaped stone with a halo of diamonds surrounding along with diamonds down the shoulder of the band. There are 40 diamonds on this ring. They all range in color from H to I and clarity from I1 to I2. They’re natural irradiated diamonds in a rose-gold prong setting. The morganite’s color is H to I and clarity is I1 to I2 and irradiated, too. This delicate ring can be resized when brought to a skilled jeweler. Many rings with morganite are cut in a cushion or square shape, but this one is in a pear shape cut, which quite stunning. This can be worn pointing in either direction, and we like to call it a teardrop shape, too. The diamonds that surround the morganite and trail down the sides of the bands number 71 and have a color of I-J and clarity of I2-I3. They’re natural, untreated stones. The pink morganite has moderate inclusions and is heat treated to enhance the color. This doesn’t have an impact on the value or durability of the stone. The morganite is 0.60 carats and the diamonds are 0.40 carats. This trio of morganite stones is a beautiful peach pink color with a channel of round diamonds down the shaft of the band. There are 8 white, round diamonds that have a minimum color of J-K and a clarity of I2-I3. They’re natural and untreated. The morganite is heated to enhance the color. While most of the other rings are a pastel pink shade, this is a stunning peach color that is complemented by the pink-gold metal. The total carat weight of the stones is 0.80. It’s available in sizes 4 through 9. There’s so much to discuss with this ring. It’s a beautiful morganite cushion cut stone that’s 1.8 carats. The center stone is surrounded by a halo of diamonds that trail down the split shaft of the infinity band. The total diamond weight is 0.27 carats. The seller is compliant with the Kimberly process of diamond mining for the 64 diamonds included on this ring. That’s a huge amount of stones. They’re a minimum color of H-I and clarity of I1-I2. While this is a size 7 ring, it can be resized quite easily by a skilled jeweler. 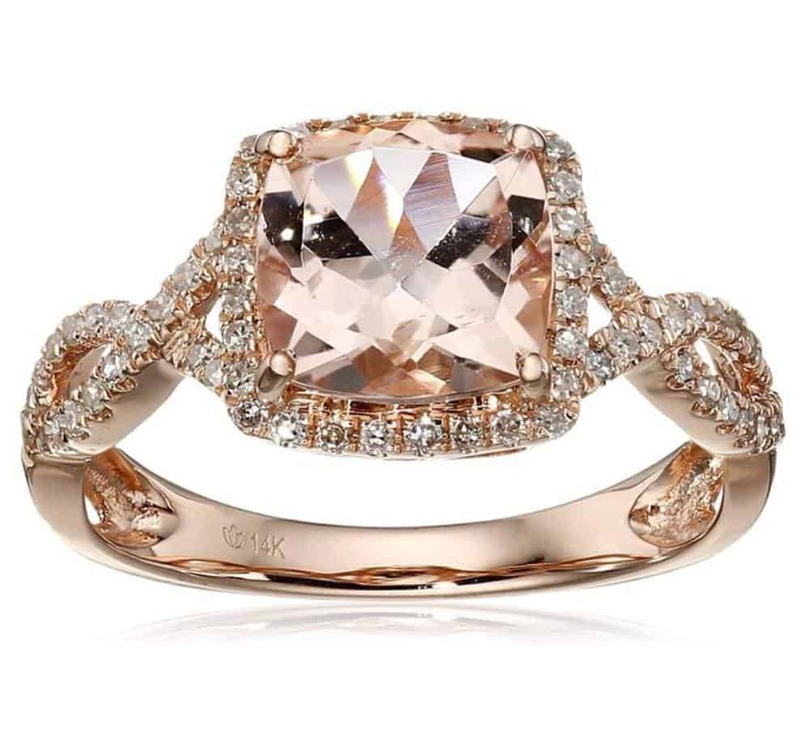 As we often do, the best was saved for last in this list of favorite morganite rings. It’s a 2 carat natural peach-pink morganite ring. It has so much going for it. First, the manufacturer uses recycled gold in all its ring production, which has less impact on the environment. Second, they also use ethically sourced diamonds. The 2 carat morganite center stone is VS clarity that has high reflection and crystallization. You can upgrade this to 18k gold quite easily and the ring is available in sizes ranging from 3 to 11. It’s also available in white or yellow gold. 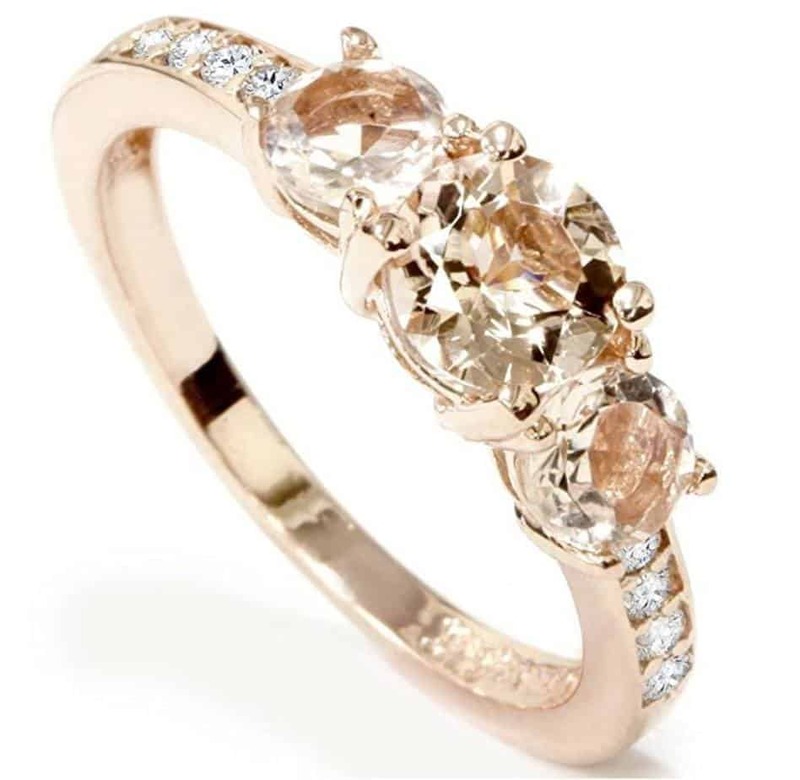 While we love the idea of options, yellow gold with a peach stone might not be as pretty as the rose gold option. There are 35 diamonds with a minimum color of G-H and VS clarity. The pretty flower design is incredibly delicate even with such a large carat stone. If you want to truly impress your lady with a pretty engagement or occasion ring, you’ll want to consider a morganite stone. It’s all the beauty of a pink stone without the huge price tag of a pink diamond. She’ll absolutely love the style and color, and you’ll be able to purchase a larger stone. You can also get one surrounded by diamonds for extra points in your favor.